The mighty figure of a giant woman with a small childlike face and a sunny hair, fragile feet and tiny hands, as if embracing a miniature egg – here is Carrington’s Giantess protecting the bird’s egg. She stands on the bottom of the world – on earth with trees, animals, people (including women) – all like insects in comparison with her – a giant and gentle, huge yet humble. Can we recognize her in the women we know, in spite of her tremendousness? Can she be recognized as a woman at all? Women are too much subdued to be capable of saving human race. Many men kill other men often because of ephemeral rage or chronic hate and they respect themselves even more after killing, although some – more sensitive amidst us, suffer mental anguish. Men love to use special tools for killing – that’s how hundreds of thousands years ago they started to invent weapons to kill animals to eat their meat and gradually “conquered” the whole planet. They’re proud of it and even more proud of wars with other humans. Today, they’re especially rewarded for killing skills. So, woman doesn’t have the ability to save her own children, let alone to be savior of humankind. When women want to boast about their massive emancipation the best they can do is to imitate men – physically (by becoming police-women or militaries or mentally – by becoming CEOs or even technical scientists). They are readily leave their children to standardized care in kindergartens and schools for the sake of career, financial reward and healthy competition for family prosperity, and they successfully compete with the thickness of men’s wallets by the solidity of their purses. Mothers today have become proudly equal with the fathers. And the uniqueness of their emotional and intellectual bonds with their children and their qualification to form the next generation’s existentially spiritual souls are exchanged on the market of generalized services. And all this civilizational robotics is alien to the personality of Carrington’s giantess (as we can feel while looking at the painting). Is she a traditional woman or an emancipated one? Is her archetype a queen? May be, a princess? Is she a matriarch? Is she a peasant? Rather, she is a nurse, she is a nurturer of life, the nurse of the living world. How she is looking at us – not looking! Her gaze is the gaze of the presence, of being here, of being with life. Yes, she is a nurse of everything living. She cannot save human beings who live to kill, not to live. The best that can be said about most humans is that they live to survive, not to live. 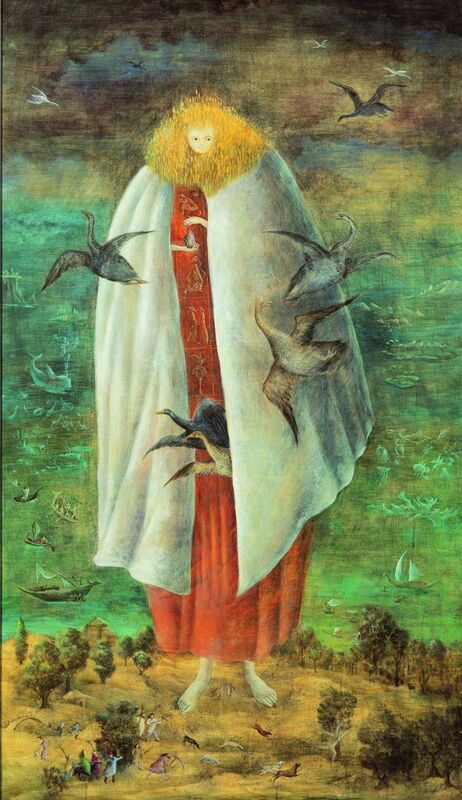 Then the best Leonora Carrington’s giantess can do is to try to save not human babies, not human embryos, but egg of a bird. How many alerted, worried, afraid birds are hovering around her in the air! We sense something apocalyptic in the very atmosphere of the natural world! The distressed birds of nature create atmosphere of an apocalyptic contrast with the artificially bright and, as if, frozen lake utilized by humans who, as if, not have even noticed nature’s turmoil. But our giantess is unconcerned about the human rituals depicted on her inside robe. She is interested neither in human activities on the lake, nor in structures of social rituals. She wants to save the bird’s egg. She cares for future. She is caring life through apocalyptic seasons. She belongs to the rarest type of a woman – woman-non-conformist, somebody who disagree not only with traditional, frustrated dogmas, but with fresh despotic customs greedy for success. 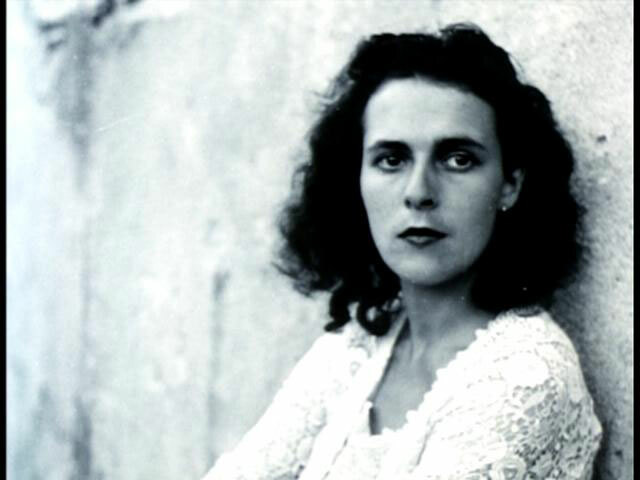 How could Leonora Carrington come to depict dedication to saving nature? She didn’t know the horrifying consequences of Global warming, its radical threat to our survival. But she knew WWII, she knew running in panic from the war. And she knew how to be a maverick and a hermit. 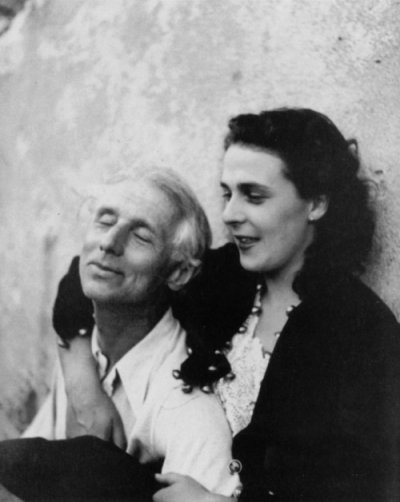 From her partner and lover Max Ernst she learned how unjust, cruel and inhumane the human world is and how desperate is the life of a genuine (non-entertaining) artist who is always not understood or misunderstood.